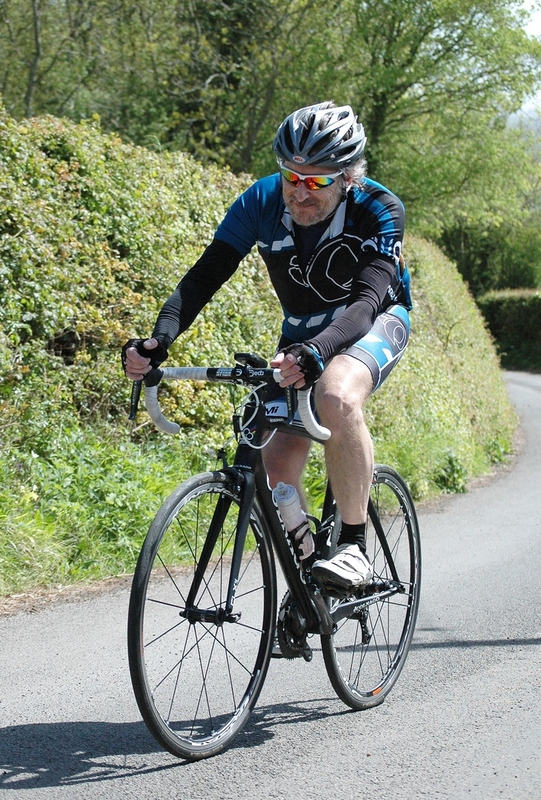 Although I didn’t blog it, I really enjoyed last year’s edition of this sportive. 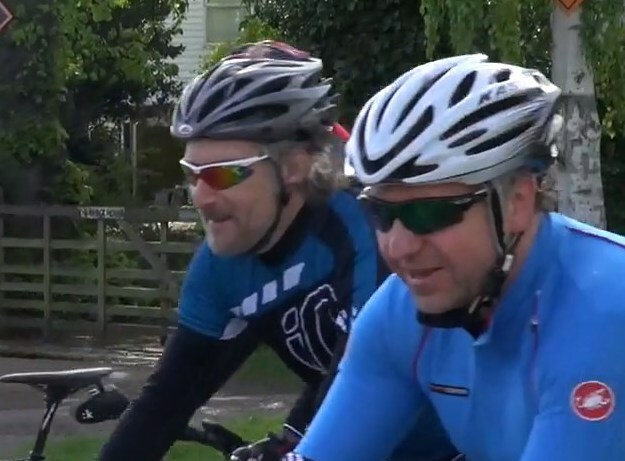 The main difference between this and other sportives is that, being a club event, lots of people know each other. Also it has a much friendlier feel to it than some of the big commercial sportives. We were really lucky with the weather today; yesterday morning was pretty wet and tomorrow was very windy (I know that because I’m writing this the day after!). It was dry and mainly sunny. The temperature when I left home was 12°C, rising to 16° or 17° through the day. 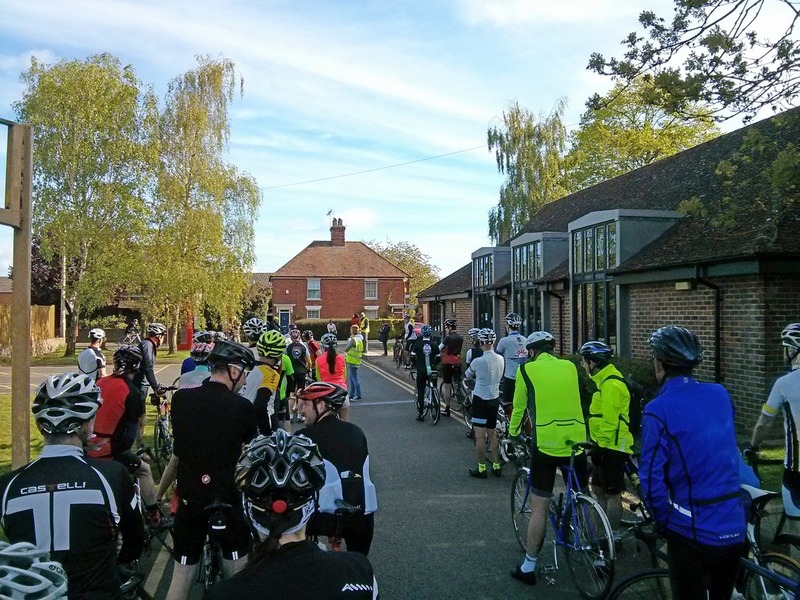 I rode a leisurely 5 miles to the start in Marden. I went into the village hall to get my number and then joined the others waiting in the car park. I saw my friend Ian waiting in line so I joined him. We were quite near the front so didn’t have to wait long for the off. About five miles into the ride came the only major climb of the day, Hunton Hill. At the top of that I found myself riding alone. I raced through Coxheath and up ahead could see that the traffic lights in the distance had turned green so I sprinted for them and made it through before they changed. In the distance I could see a group of riders who seemed to be going at a decent rate, so I put in a big effort to catch up with them. This took quite a while, which was a good indication that they were going at a good pace but one I should be able to maintain. There were five or six riders in the group, and now me. Over the next 25 miles we averaged 20 mph. At times I was just about able to hang on to them so I didn’t feel I would be able to contribute much by doing time at the front. Yet around about Pluckley I found my way to the front and did my turn. A few miles later, a couple of strong riders came by and I managed to stay with them and they dragged us all along. A couple of miles after Biddenden, the Abelio racing team came by (that’s San Fairy Ann’s racing team), and shortly after that we all had to give way at a junction. I took this opportunity to jump on the back of the Abelio boys and ride with them for a while. It lasted less than two miles before I could no longer stay with them, so just after Tenterden I found myself riding alone; the group I was originally with were now behind. I bombed down Appledore Road at an average of 26 mph. Shortly after that, the group I had originally been with caught me again, and this time I was unable to hang on and they passed me as we headed towards Rye. I think I had over-cooked it by trying to stay with the Abelio team and staying out on my own. The others disappeared into the distance and I was on my own again. Up until now my average had still been 20mph, but now it dropped to 17 for the next few miles but picked up again to 19 for the three miles along the Military Canal Road, luckily with a tail wind. That’s where the feed-stop was. I stopped for less than two minutes, just enough to top-up my water and grab a piece of flapjack. Up to that point I’d had a bit of a banana and about two energy gels; not much really but I couldn’t face anything really sweet, even though there were lots of delicious cakes on offer. I cycled off eating the flapjack as I climbed the fairly steep Knock Hill. The flapjack was quite dry and I could have done with some water but I didn’t have any spare hands. It’s quite difficult to eat while climbing a hill. The flapjack was progressively falling apart in my hand and I sort of crammed as much of the last bit in as I could, quite a lot of it crumbling down my front and around my mouth! I could then grab a drink and wash it down. Luckily I had brushed all the crumbs off me before I rounded the next bend because there, at another steep part of the climb, was the event photographer waiting for me! As I passed I said “That’s evil”. She said “you’re at the top now”. I think she thought I was referring to the hill, but I was actually referring to the habit of sportive photographers waiting at the top of steep climbs to capture riders in their moments of suffering! Shortly after that I looked down at the Garmin and was pleased to see only 25 miles remaining. From there to the end I averaged 17.4 mph, which is not bad considering the slightly lumpier terrain. I was riding on my own until I came to an unexpected climb just before Tenterden (Small Hythe Road). I heard a voice behind me say something and I muttered something in return. I realised it was one of the riders in that group I had been with earlier – I must have passed him at the feed station. So we rode together swapping leads. Then another one or two riders joined us. For most of the last ten miles I led a group all the way back. All except the guy I met on the hill – he found some reserves of energy and shot off ahead about 3 miles from the end. I dragged the rest of us back as best I could. I didn’t even know who was behind me, I could just hear their wheels. The last 2.7 miles of this sportive are very fast into Marden. I averaged 23 mph. I kept expecting one of the others to pass me in a sort of last ditch effort, but no-one did. Even when we were coming up to the 30 mph sign at the start of the village no one deigned to sprint for it. I did briefly look round but nobody made a move. About 200 metres before the end there was a set of roadwork traffic lights and they were red. There was a car waiting. One of the riders I was with went flying through. I didn’t want to do this and promote cyclists’ already bad reputation when it comes to traffic lights, so I thought I’d go up on the pavement and around the roadworks that way. But after I mounted the pavement I had to make a sharp right turn to avoid an unexpected low concrete wall. In doing this I totally lost control of the bike and crashed down heavily to my right. My head hit the road hard. I immediately got up, briefly wondered whether I might get concussion, but I seemed to have my balance etc, so quickly checked the bike was operational, got on it and set off. One of the riders I had been leading had caught up by now and shouted “you OK?” as he rode by. “I’ll tell you in a minute!” I replied, meaning that I didn’t have time to work it out just then. The finish beckoned! So I rode the couple of hundred metres to the village hall, gave my number to the steward, and then worked out what bits of me hurt. I checked my helmet but it hadn’t cracked under the impact. I’m sure glad I’d had it on though! The most pain was from my right wrist, yet I could move all fingers and appeared to be able to move it around OK. I stayed there for another 45 minutes or so speaking to friends and seeing riders as they gradually came in with their own stories to tell. I grabbed a sandwich and a sausage roll. I checked my official time on the screen – 4 Hours 10 minutes – enough for a Silver! News came in that several other riders had been involved in various accidents. One girl said that she had never seen so many accidents. And yet from my perspective everything had been totally OK (until the end!). I felt a bit out of sorts post-ride, mainly from the shock of the fall, I guess. I bid my farewells and gingerly rode home, trying not to put too much pressure on my wrist. I realised that my right brake lever had been twisted in the fall. It still seemed to change gear OK though. Five miles later, I just about managed to drag myself up Barn Hill to home. That’s when I realised I had bruises on my right hand and wrist, a bruise on my left hand, pain in my right hip (probably just another bruise) and quite a bit of pain in right elbow. Maybe I twisted or over-exerted it during the fall. I ice-packed my wrist with a bag of frozen sweetcorn. When I uploaded the data to Strava and Ride-with-gps, I saw that I had averaged 17.9 mph. I have never achieved that sort of speed over such a long distance before, so I was really pleased about that. I also got about 37 Personal Bests! Just a shame about the stupid ending!